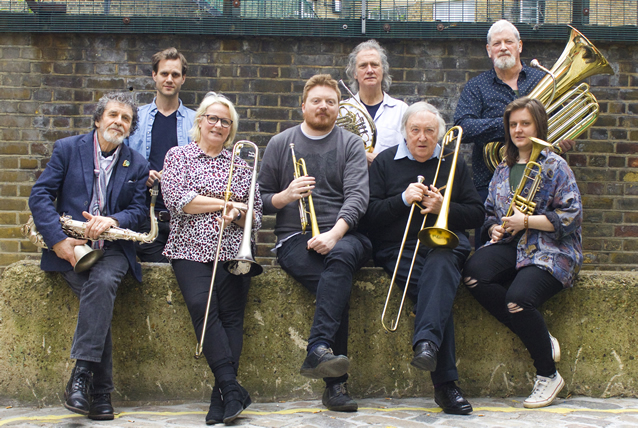 The Brass Monkeys have just reformed with a mix of some of the UK’s most exciting players to explore the textures and timbres that a group of excellent improvisers can bring to this music. The band was originally conceived as a quintet of 3 saxophones, guitar and tuba and recorded a CD on 33records in 1999. The band developed into a 7 piece format in 2016 and toured the UK in December of that year as part of a Triple Bill of Norwich based bands with funding from Arts Council England. The tour finished at The Vortex in London on 21/12/16. In the spring of 2018 the line up changed to include trombonist Annie Whitehead, trumpeter Charlotte Keeffe and saxophonist Paul Jolly and in December 2018 we expanded to an octet when we were joined French Horn player Jim Rattigan and drummer Olly Blackburn. Over the years ensemble members have worked with (to name a few) Joan Armatrading, Lianne Carroll, Elvis Costello, Julia Doyle, Joe Gallivan, Joe Jackson, Chris MacGregor's Brotherhood of Breath, Louis Moholo Moholo, Laura Mvula, Maggie Nicols, Natural Causes, Courtney Pine, Dudu Pukwana, The People Band, Chis Rea, John Russell, Paul Rutherford, John Stevens, The Style Council, Keith Tippett, Jah Wobble, Robert Wyatt….